This is an oldie but goodie. Within, young Mary Lennox has been raised in India, but her socialite parents had little to do with her. When they die in a cholera epidemic, she’s sent to live with her uncle in England. Unfortunately, Mary has become a sickly, ugly, and a nasty little tyrant. And misfortune upon misfortune, her uncle—a man with his own heart-wrenching troubles—also wants nothing to do with her. So she comes to live in Misselthwaite Manor, “a home with a hundred rooms, nearly all shut up and with their doors locked…a house at the edge of a moor.” It’s an intriguing setting. At first it seems dark and forbidding, with always rain and gloom. But as spring returns to the moor and Mary ventures outdoors, she discovers unexpected beauty. She also meets some wonderfully kindhearted Yorkshire people—the maid, Martha, and her younger brother, Dickon—who influence her for the better. Slowly, she becomes less horrible. The two discoveries, however, that most influence her change of heart are a secret garden that hasn’t been opened since the mistress of the manor died ten years before and the baby whose birth killed her, now ten years old, unwell, and even more tyrannical than Mary. Colin Craven has been told he was crooked and ill from earliest childhood and grown to believe it. He’s been ignored by his father who couldn’t bear the pain of looking at him, and he’s been obeyed unquestioningly by the servants. But in Mary, he meets his match. Their childish tantrum are quite hilarious, even though you’d like to smack them both. But it is the secret garden, the mysterious, locked garden, that becomes the most influential character in the book. The wonders of blue sky, crisp air, and shoots of green hold magic for a child always sickly and languid in the tropics and another who never before left his stone-walled room. The transformations it causes, both physically and emotionally, are remarkable and complete. It is the setting and characters which drive this book. The classic old, dark British manor house is mysterious and stereotypical, but it’s also full of wonder. And even though Mary is a beastly little thing, I couldn’t help feeling a bit sorry for her. “Other children seemed to belong to their father and mother, but she had never seemed to really be anyone’s little girl.” I felt equal pity for Colin. And it helps that both children have the fortitude and willingness to change. Dickon, the Yorkshire country boy, is quite unrealistic. He’s always smiling, agreeable, gentle, and surrounded by wild things that trust him, but the book rather needed a cheery chap to counteract the two tyrants. The plot is just a bit dull by today’s standards. Not much happens outside the discovery of the garden, the working of the garden, and the transformation of the children, which also strikes the modern reader as a bit unrealistic. Back in that day, when there were no malls, no internet, no video games or movies, watching and helping a garden bloom might have held more wonder and entertainment. Today it seems a bit unexciting. However, gardening does still hold an allure for some kids. My son, since he was three, has been helping me plant and harvest in my own backyard patch. Two of my kids love to grow pumpkins to sell every year. And each spring, lessons about seeds, flowers, plants, etc. blossom in schools across the country. This book is still relevant. The adventure is simply gentler, and the writing older, sweeter, and more quaint. But it is extremely readable, and the interaction between characters is entertaining. 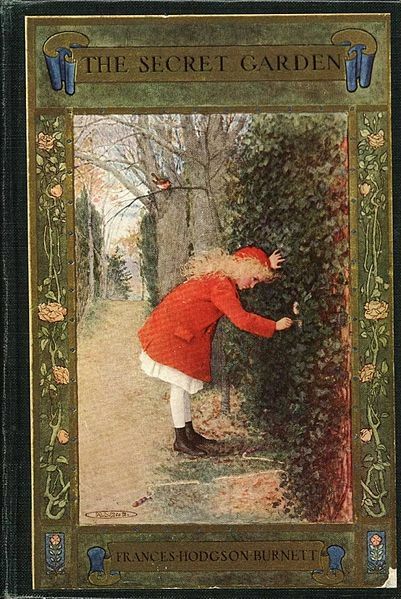 I’d recommend The Secret Garden for seven- to eleven-year-olds—particularly in the spring—but kids beneath a fourth or fifth grade reading level might need some assistance. It would make a very nice read aloud. It’s also free in the Kindle store. It is funny that you said younger kids need help reading this because I read this book to Josie 😉 We liked the story! Erik, you are a very cool big brother! It may be a little dull but it is a story that has stayed with me since I read it as a kid. I can’t believe it was written in 1911. I didn’t know it was that long ago. I am impressed that you can grow enough pumpkins to sell. We have trouble getting one pumpkin for us to use to survive. Thanks for reminding me of this great book with the review. Actually, I don’t think kids who love books will find this one dull at all, even today. And it’s surprising what even “tough” kids will enjoy if it’s presented or read to them. But it’s slow compared to today’s commercial lit. Sorry to hear about your pumpkins. Try a gourd mix next year. They’re much easier to grow, and it’s fun to select from all the weird-shaped fruits. it is nice to see a classic reviewed. I will always love these sort of books and when you read them to young people, they love them too. Exactly, Darlene! Probably not a lot of kids would pick this off the shelf, but if WE do and then we READ THEM TO THEM they will come to love these oldies too.